YQuiltshopgal....http://quiltshopgal.com/2015-free-motion-quilting-challenge-may-challenge-with-cindy-needham/ has been hosting this challenge again this year. We are in our fifth month already, and having fun!!'! 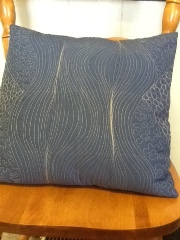 Create a pillow using the free tutorial from the 2012 FMQ Challenge, by Cindy Needham. This is a great learning opportunity where you will learn about Cindy’s approach for “divide and conquer”, S-Curve and more. I took a little differnt approach this time around, though. I had this swirl design in my head for some reason,and went with that. 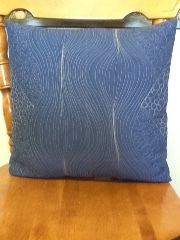 I filled the Center swirls in completely...then added a little pebbling and stapling to the sides of the pillow. love it!! I didn't try to keep my swirls exactly the same...just flowing and had so much fun with it. I used Kona Denim and signature gray thread on my Tiara. Thanks for taking a peek...now please go to the link above and see the gorgeous inventions. Wow, very nice. I love it! I'm always afraid to "get out of my box" and do FMQ. That's why I bought a Statler. I'm always so envious of all of y'all that can do it. Very nice...Like what you have done with your pillow. That looks great. The swirls make such a great quilting design. You made a very nice pillow. I like it. Lots of movement happenin' with your pillow! Fun! great cushion.. I love the flow the quilting gives. WIP Wednesday/ Spring has Sprung!!! !